And it all started with three explosions in the summer of 1945. 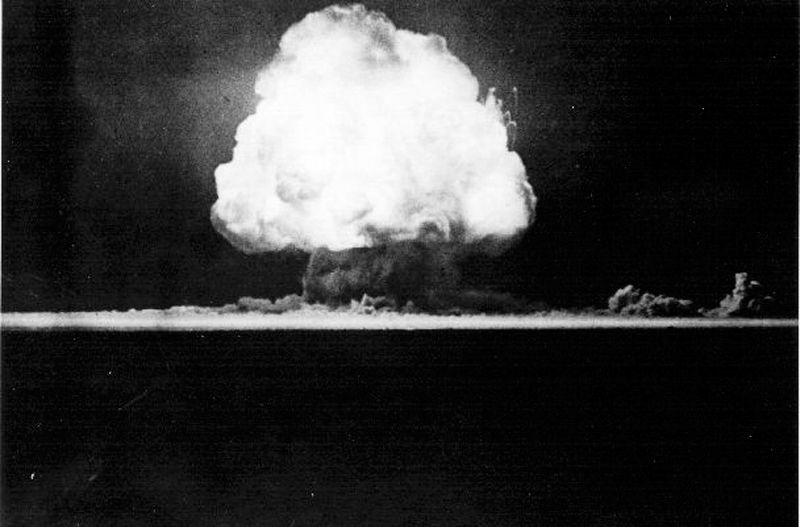 Seventy years ago today, at 5:30 a.m, a device referred to as “The Gadget” (by those few who knew about it) was detonated in the New Mexican desert northwest of Alamogordo. The so-called Trinity explosion unleashed the equivalent destructive force of 21,000 tons of TNT, producing a fireball 7.5 miles high, which could be seen as far as Santa Fe to the north and El Paso to the south. The nuclear age had begun. On the same day, a uranium device codenamed “Little Boy” was loaded onboard the USS Indianapolis in San Francisco, bound for the Pacific island of Tinian. Untested, though deemed reliable by the same Los Alamos scientists who built the Trinity bomb, Little Boy was detonated over the Japanese city of Hiroshima a mere three weeks later. Three days after that, on August 9, a plutonium device similar to the one tested in New Mexico, codenamed “Fat Man,” was dropped over Nagasaki. These were the only three nuclear explosions during World War II. In 1945 the only feasible method of delivering these fearsome weapons was with heavy bombers. For the nuclear attacks on Japan, B-29 Superfortresses left from Tinian, in the Northern Marianas, and flew for six to seven hours before reaching their targets. The development of multi-stage rockets in the 1950s led to Intercontinental Ballistic Missiles that eventually replaced bombers as the main strategic nuclear weapon delivery system. Capable of traveling more than 6,000 miles in less than an hour, ICBMs armed with nuclear warheads irreversibly changed the nature of international power politics. The advent of thermonuclear bombs by 1952 increased the destructive power of these weapons a thousandfold. In 1961 the Soviet Union tested the largest bomb ever created—the Tsar Bomba—with a yield of 50 Megatons, the equivalent of 50 million tons of TNT. Delivery systems became more sophisticated as well. By the early 1960s both the Soviets and Americans had stealthy Submarine-Launched Ballistic Missiles (SLBM), which could launch a missile while the submarine was still submerged. By 1970 the United States also had Multiple Independently targetable Reentry Vehicles (MIRV) with multiple warheads that could be independently aimed to strike different targets. During the Cold War the nuclear arsenals of the United States and the Soviet Union peaked at more than 32,000 and 45,000 weapons, respectively. Today nine nuclear powers (the United States, Russia, China, France, the United Kingdom, Pakistan, India, Israel and North Korea) have less than 16,000 combined. Several other nations have sought to acquire, or have since abandoned, arsenals of their own. Nuclear proliferation is an ongoing global concern, and will remain so for the foreseeable future. The nuclear age represents the first time in history that mankind possesses the ability to annihilate itself, along with a significant percentage of life on earth. Humans are not in the habit of losing scientific and technological capabilities once they have been discovered, and it is reasonable to assume that the nuclear age will continue for as long as civilization survives, or until nuclear weaponry is replaced with something even more formidable. So while the anniversary of the creation of our most destructive weapon may not be an event to celebrate, it gives us an occasion to remember, and reflect. Adam Frost is a Masters student at the Centre for Military and Strategic Studies at the University of Calgary, specializing in Foreign and Defense Policy.